I’ve been doing a countdown on different topics this week from 7 to 1. Today is Christmas, so here’s #1 and of course #1 is Jesus. There might be a lot of reasons to celebrate on Christmas; family, food, health, presents, etc. However, without Jesus and what He has done for us, all of those things would have the shadow of sin and death looming over them. But because of Jesus we can have boundless, unhindered joy because He has conquered sin and death. What a blessing to again hear this truth: Unto you is born...a Savior. I'm doing a countdown beginning from 7 to 1, with 1 being on Christmas Day, with each day having a different topic. Today I'm sharing with you 2 Christmas prayers. The prayers I'm sharing are uses as "collects" in the Divine Service. A collect "collects" the main theme of the service and brings it before God as a prayer. I am putting these here so that you may use them on your own as well, if you would like. Prayer #1: The Collect for Christmas Eve O God, You make us glad with the yearly remembrance of the birth of Your only-begotten Son, Jesus Christ. Grant that as we joyfully receive Him as our Redeemer, we may with sure confidence behold Him when He comes to be our Judge; through the same Jesus Christ, our Lord, who lives and reigns with You and the Holy Spirit, one God, now and forever. Amen. It's the week before Christmas, so I'm going to do a countdown beginning today from 7 to 1, with 1 being on Christmas Day. Each day will have a different topic. Today I'm sharing with you 3 Christmas Artworks. 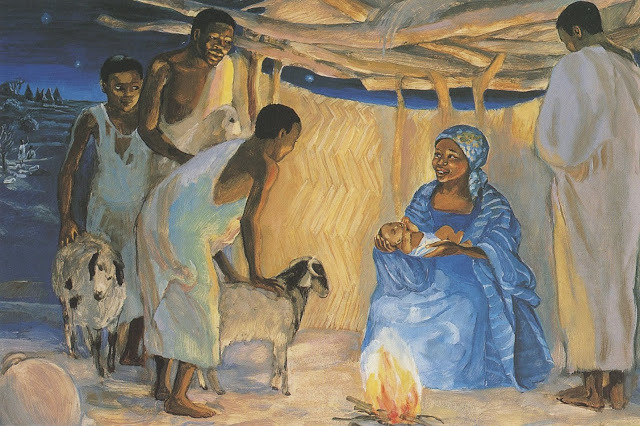 Below are three different depictions of the nativity scene. None of them are what could rightly be described as "accurrate" insofar as showing what the setting and the people probably looked like, but that doesn't bother me at all. In fact, what I like about these is that the artists show people to whom their audience could relate and surrounding a Savior to whom they can also relate. It's a reminder that Jesus came to be the Savior for people of all colors and from all nations and cultures. Today I'm sharing with you 4 Christmas songs that you might not know, but probably should. This is a beautiful, newer song that is rich with the words of Scripture and the implications of Jesus coming into the world. Today I'm sharing with you 6 prophecies fulfilled with the birth of Jesus or shortly thereafter. Prophecies #1 and #2: Isaiah 7:14 In this verse we actually get two specific and astonishing prophecies that are fulfilled by Jesus. First, the prophecy that He will be conceived and born of a virgin and second that He will be called Immanuel. The virgin birth is indeed a miracle only possibly by God, but for God (as Gabriel reminded Mary) all things are possible. The virgin birth is important because it is the fulfillment of this prophecy, but also because Jesus was born without having the sinful nature passed on to Him as would have happened with a "normal" conception and birth. Today I'm sharing with you 5 Christmas quotes to reflect upon. Quote #1 This is from Charles Porterfield Krauth's magnum opus, The Conservative Reformation and its Theology. It is a quote pertaining to Martin Luther. All days were Christmas to the great Restorer. He had found the Christ, and when he was not kneeling with the shepherds, he was singing with the angels. Quote #2 Here is a quote from that great Restorer, Martin Luther. Today I'm sharing with you 7 Christmas albums worth listening to both leading up to the celebration of the birth of Christ on Christmas and throughout the 12 days of Christmas (which begin on Christmas Day and end on January 5th). I'm sure all of these are available on iTunes and Amazon, but I'm linking directly to the store of the artist when possible. Also note that the order does not indicate any sort of ranking. 7. "O Holy Night" by Sara Groves Sara Groves has a beautiful voice and on this album she gives new voice to some familiar Christmas hymns, including "O Holy Night," "Angels We Have Heard On High," and "It Came Upon a Midnight Clear." The rest of the album is great too, but parents will especially enjoy her song "Toy Packaging."